Alondra decided to be little red riding hood with a little twist. she had a little encounter with the Big Bad Wolf!! 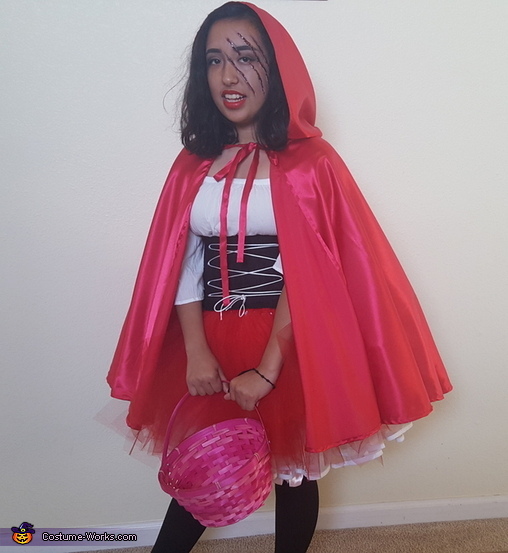 makeup was done by auntie Anahi, cape by grandma from silk fabric and the costume myself (mom). I made homemade blood thanks to pinterest pins and latex from the halloween store. Her tutu was made from tule that i bought at Joanns for super cheap on a sale. The petticoat and corsage we already had since she is in dance but just added ribbon in the front and white shirt from Forever 21. she had lots of fun with this costume since she was involved a haunted house to raise moeny for her band at school. i was not able to get a full picture of her with her actual makeup on THE day but i did on the day before on her way to the haunted house.